Have you ever clicked a link to a video or web-only show only to find out that it doesn’t allow playback in your location? Most of us outside the US have this limitation on what is available and viewable due to networks implementing geo-restrictions. Websites that stream full TV shows and episodes are being blocked (possibly to avoid any local syndication issues) which leaves most of us waiting for late airing on our cable channel. Fortunately, there is UnoTelly. It’s a service that bypasses this limitation legally and allows outside IP address access to US-only content. If you also happen to have Amazon Video, Netflix, Spotify or Hulu accounts, they will now also work outside the US. 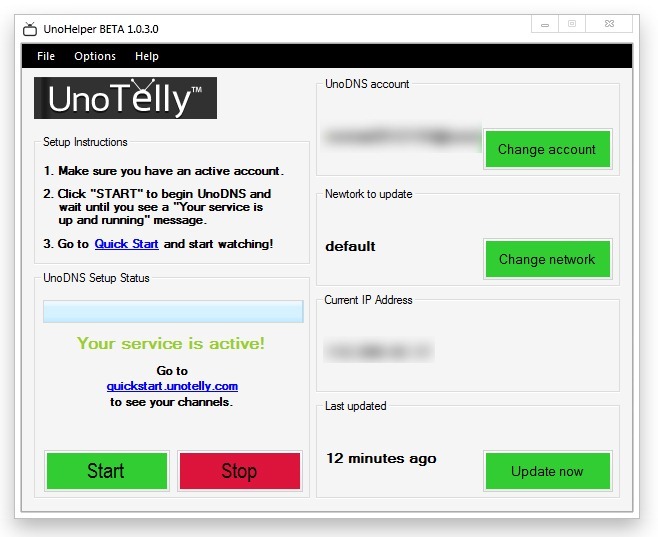 UnoTelly is a DNS-based system that allows to its customers to watch their favorite TV channels wherever they are, with any device they have, without restrictions. With few words, it's an online TV service that bypass geographic limitation. I was able to try out the service which required me to download UnoHelper, an automatic IP and DNS configuration tool which allows users to Start and Stop UnoTelly. It was easy to install and I was up and running in no time. After starting the service, I visited a number of channels like ABC, Food Networks, National Geographic and NBA TV. 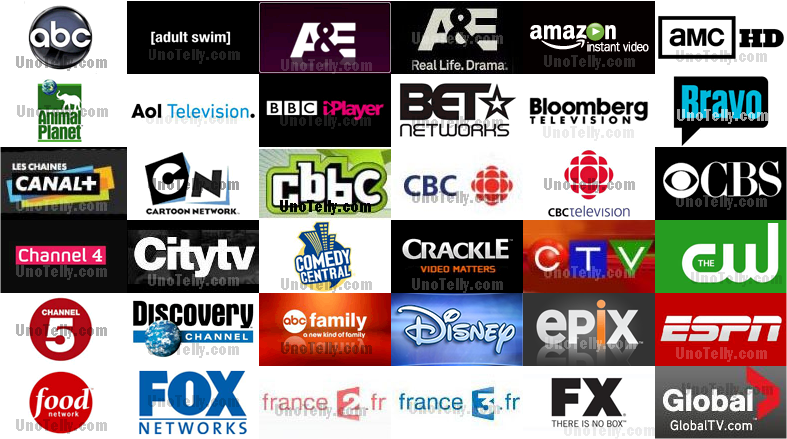 The above channels are just some of the selections you can choose from. Check here for a complete list of channels. Thankfully, UnoTelly provided me the Gold Plan, so I was able to browse the complete channel lineup. The ‘No Bandwidth Cap’ also allowed me to stream as much content as I wanted without any limits. UnoTelly works with all the devices. PC, Mac, Linux, PS3, XBOX360, Wii, iPhone, iPad, Android phones and tablets, Blackberry Playbook, WD TV Live, Roku, Boxee Box, OpenElec, XBMC, Apple TV, Google TV, LG Smart TV, Sony TV and players, Panasonic VIERA, Samsung TV and players and all routers including DD-WRT. So far, It has been working perfectly on mine. I had some slight problems on some channels not working but UnoTelly support was quick to note that a fix was in the works. Overall, I’m pleased with the service and can attest that it really works as advertised. I also love the fact that Pandora is now working for me. UnoTelly service is really a no-brainer when it comes to online video and on-demand streaming for people outside the US or for those who will be travelling abroad and doesn’t want to miss any of their favorite shows. It’s simple to setup and works at a fee that is not much if you are already into subscription services. Our monthly cable TV bill is even more expensive. Premium Plans will cost around $5 (around 220 pesos) a month, while the Gold plan with complete channel access will be $8 (around 350 pesos). 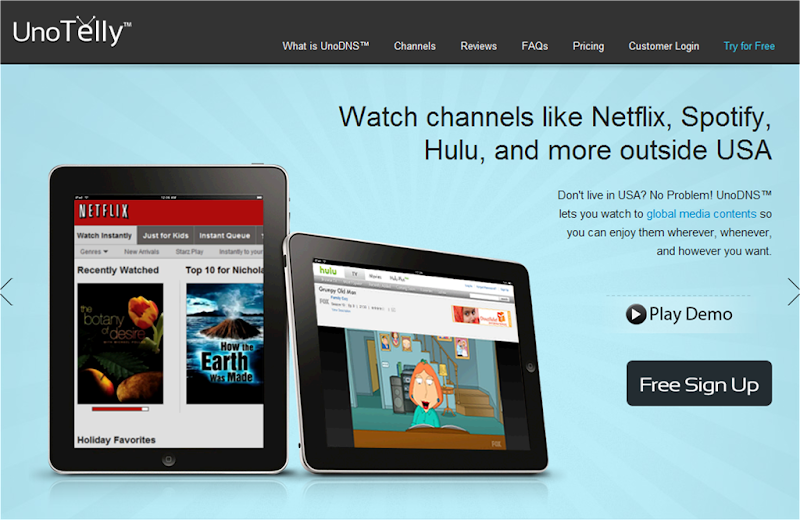 If you want to try out UnoTelly, you can sign up to their 8-day full free trial. Techolo (or Technology Outlook at that) is not your ordinary tech blog. We curate our posts to bring you unique content on current technology trends, gadgets, news, reviews and other geek pop culture stuff - and of course the occasional sponsored posts :) I hope you won't mind.